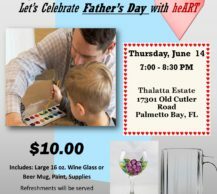 Father and Child Glass Painting at Thalatta Estate, Thursday June 14, 7:00-8:30 pm. Share an evening of Father’s Day bonding with art. Paint your favorite images on a 16 oz. Glass Beer Mug. $10 includes all supplies. Refreshments will be served. Moms are invited too!